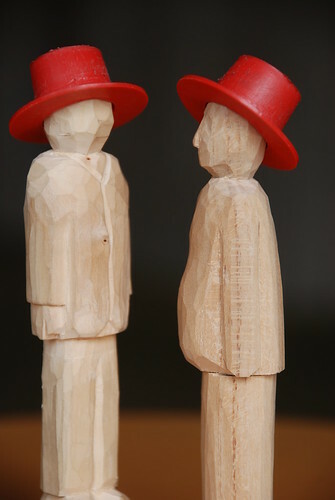 These 2 chaps were carved to amuse myself on 2 different trips away. The Welshman on the left was carved in Trawsfyndd last Easter and the Yorkshireman on the right was carved on the beach at Filey last summer. Nowadays they stand as sentinels in alcoves on either side of the fireplace, where they’ve been since they first came home. Their rather rakish headgear was a later addition, when we realised that the thread protector caps off a new radiator fitted exactly onto their heads – Coincidence? I think not.